First, you need to navigate to the workflow sections, which you can find under the contacts tab. Then, you want to say create new workflows in the top right and the process will begin. First, you will want to decide the type of workflow you want to use and name it. There are 3 options. Standard: These trigger once a contract meets specific criteria. This is the most common type and often trigger once particular form is completed or a particular form response is received. Fixed-Date: This workflow is very similar to the standard type, but delays actions until a particular date is reached. These are best used for sending date specific emails, such as holiday emails or upcoming events you are holding. Contact-Date: This workflow is similar to the Fixed-Date Type, but instead of choosing a fixed calendar date, you must choose a contact property that uses dates. Manually: As the name would indicate, this is a workflow you can create that would only trigger when a contact is manually added. 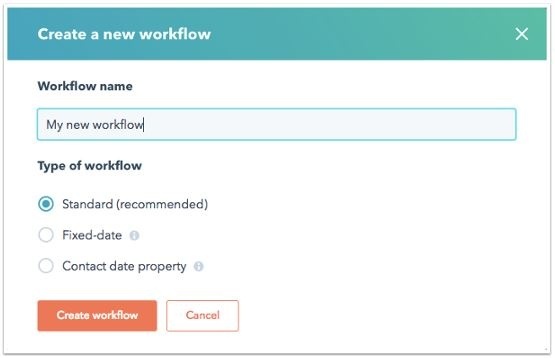 Automatically: This option will be used most often and it will dynamically enroll contacts based on the enrollment criteria you set at the beginning of the workflow. Each of these properties can be use together to narrow or expand your audience by using the and/or options. Contact hasn’t engaged in any way with the website, content, or emails. On top of these actions, there are additional stipulations you can use to either negate certain actions or delay them. These two options are the If/Then Branch and Delay. The delay option allows you to place a specific time frame between actions. This is great when creating Lead Nurturing Campaigns because you wouldn’t want all of your emails to send at once! The If/Then Branch allows you to use the enrollment criteria above farther down in the workflow, which can help you tailor your message to your contacts. For example, if you wanted to offer an eBook to your contacts by email, but didn’t want that email to go to contacts who already downloaded it, you could use the If/Then Branch to by pass contacts who had previously downloaded it. All of these different options can help you create the perfect automation to improve your sales and marketing teams! Settings offers you an area to create rules about how your workflows will execute. There are two sections. Frist, the General section allows control over the days and time your workflow will execute. It will also allow you to specify your target personas and associated campaigns. The Unenrollment and Suppression section allows you to control how contacts are removed from either the current workflow or other workflows. It also allows you to choose suppression lists for contacts you don’t want to be enrolled in the workflow. Workflows give you the option to set an end goal for your workflow. This feature will calculate how many of your contacts reach your goal, which you will choose from the same enrollment criteria above. And this is just the tip of the iceberg of things you can do. Workflows is very intricate and can help your team improve its results. Start your own workflow today and get creative!